Teens Jerome (L) and Ja'shawn (R) volunteered as junior aides at Eva's Summer Program for the children of Eva's Village. 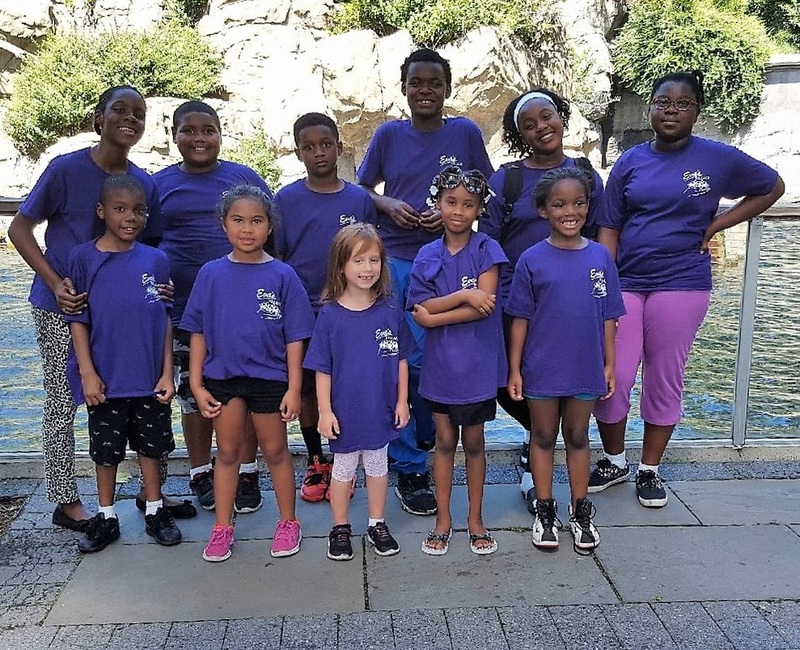 The children of Eva's Village visit the Bronx Zoo, a Summer Program field trip. 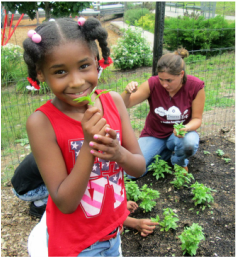 Eva's kids spent a week learning to plant, tend, harvest and prepare fresh produce at HealthBarnUSA®. The Summer Program for the children of Eva's Village has just come to an end, leaving our kids with memories of adventures and new experiences to share with classmates when school begins in September. The eight-week program planned by our Childcare and Education team has been filled with learning, enrichment and fun - all thanks to the generosity of our donors! Favorite activities have included swimming lessons at the Paterson YMCA, baking cookies for the staff and residents of Eva's, field trips to the Central Park Zoo and Jenkinson's Aquarium, and horseback riding at the Garret Mountain Equestrian Center. They also spent a week at HealthBarnUSA®, learning to plant, tend, harvest and prepare fresh produce; played sports; and participated in a dance camp, culminating in a performance at Giggles Theater for young patients at St. Joseph's Regional Medical Center in Paterson. 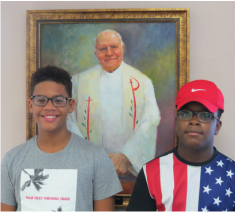 This year, Jerome and Ja'shawn, teen-aged graduates of Eva's Summer Program, volunteered as junior aides, assisting the education staff to keep younger children engaged. While they say it was easy sometimes to forget their responsibilities and start acting like campers, it is clear that this experience has helped them to grow. They are learning to shift gears as they realize they are now role models for the younger children, and there are consequences to their actions and choices. “Now I’m beginning to understand what my Mom meant when she would say, ‘You’ll understand some day,’ ” said Jerome. Ja’shawn tries to “be prepared, be responsible; take care of the kids; and tell them to do the right thing.” They agree it can be a challenge to live up to these responsibilities, especially when “some kids move faster than you expect,” noted Jerome. Most importantly, they realize they can help the shy kids to feel more comfortable because they understand where the younger kids are coming from. Both boys used to live at the Hope Residence at Eva’s, and now each has a home with their mothers and siblings. They remember all too well what it feels like to move all the time, to always be the new kid in school, and to hold back because you don’t trust the adults around you. “We know that some kids are shy because of their environment,” Jerome said. “We want to make those kids comfortable. We know they want to feel safe,” observed Ja’shawn. We are beyond grateful to our generous supporters who have helped to make this summer an unforgettable one for Jerome, Ja’shawn and all the children of Eva’s Village! Click here to see more photos of our kids’ summer adventures!